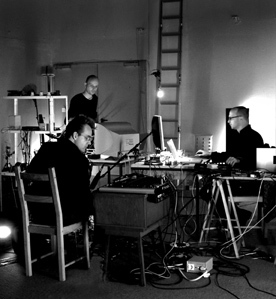 HKM+ is an ensemble for electroacoustic improvisation which consists of ludger hennig – software instruments, christof knoche – bass clarinet / electronics and markus markowski – prepared guitar/ software instruments. originally formed as a trio, the ensemble extends its line-up by guest musicians to allways renew its musical language expressed in the ensembles name by a +/plus. the ensemble extends musical improvisation with electroacoustic instruments that are connected to a network based on audiosignals and network communication. the aim of this project is to create transient- and spatial situations in this musical network through improvised musical articulation. the musical material of each of the performers is distributed to each of the clients of the improvisation network. the transformation of the sounds is realized by self-programmed elect! roacoustic instruments. an electroacoustic language arises in which the musical vocabulary and musical gesture is affected, influenced, and manipulated by each of the participating soloists.